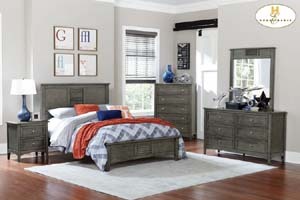 Transitionally styled for your bedroom is the Garcia Collection. Created for versatile placement within a number of environments the louvered panel accents, distinct framing along with a cool gray finish over birch veneer combine to provide a clean palate for your personal decorative style. Nickel knob hardware provides subtle, yet distinct, contrast to the fronts of each case piece. The available desk is a functional addition to the collection with keyboard tray and drawer storage. The collection is offered in twin, full, queen, eastern king and california king for the perfect fit within your bedroom.